Even in a time of restraint dinosaur books keep pouring into bookshops. 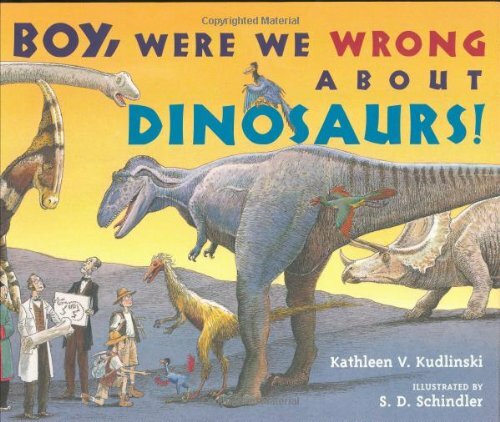 This book stands out because it helps young readers to learn about both dinosaurs and the dynamic nature of knowledge. Text and pictures work together to show us how evidence is gathered and how from this evidence scientists deduce what dinosaurs looked like, how they cared for their young and why they died out. But the theories are always provisional because deductions are limited by the fossil evidence available at a particular time. No book of this sort could avoid discussing ideas about one of the great mysteries: how dinosaurs died out. Scientists have, for some time, leaned towards the possibility that a comet or asteroid may have hit the earth, poisoning the rain and blocking out the sun. What is the evidence for this? ‘In the last few years, we have found a fossil layer of dust originating, probably, from outer space.’ The key word is ‘probably’: further discoveries may mean we have to think again. Other intriguing questions raised here are whether dinosaurs had grey or highly coloured skins and whether some smaller ones had feathers. When scientists first found the bones of Iguanodon, amongst them was a small bone that seemed to fit like a spike on the creature’s nose. But when a fuller set of fossil bones was discovered, at a later date, not one but two ‘spikes’ were found. This led scientists to conclude that these small bones were part of the dinosaur’s hands and not its nose. This is the sort of thing that young readers love. This book poses questions that will interest children, invite them to think in a more than superficial way and encourage them to find out more.